They have sold over 200 million records worldwide, over 71 million in the US alone. They are the 5th highest-selling band in US history. They are the 10th highest selling artist in US history, and the 14th worldwide. 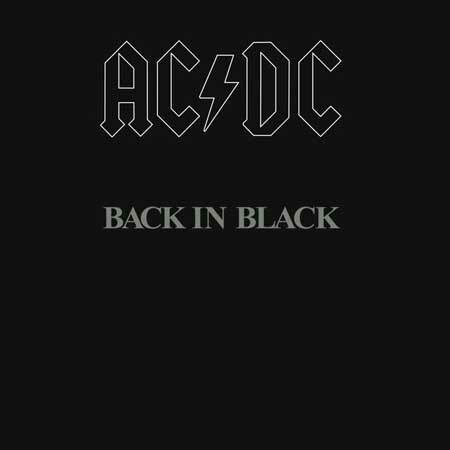 Back in Black is the third highest-selling album by any artist in history by worldwide claimed sales figures. It is also the number 1 selling album recorded by a rock band. The accolades go on and on, so check any major publication’s lists of the greatest bands or artists, and you’re sure to see AC/DC appear. They are considered one of the most, if not the most influential rock band of all time and for good reason. 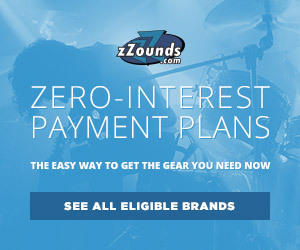 Countless artists point back to the band as a template for what hard rock music should sound like. As a matter of fact, they do it so well that if anyone even came remotely close to the sound of the band they’d be doomed. It’s that good. In late 1973, Malcolm Young’s band the Velvet Underground (no relation to the Lou Reed-fronted outfit) had broken up and he was looking for new work. He recruited younger brother Angus Young as well as bassist Larry Van Kriedt, vocalist Dave Evans, and drummer Colin Burgess. Malcolm and Angus needed a name for their group, and the answer came from an unlikely source. Their sister Margaret saw the initials “AC/DC” (an abbreviation of alternating current/direct current) printed on the side of a sewing machine, and the brothers found it a perfect name for their brand of power rock music. The rest is history. Believe it or not, early in the band’s history they went through a glam rock phase and the members all wore satin outfits among other getups and gimmicks. Angus himself even attempted to wear a gorilla suit, Spider-Man costumes, even Zorro and Superman. It wasn’t until Angus’ sister Margaret suggested he wear his school uniform as a stage costume that it all came together. What would the band have done without her? The band’s only issue was that their singer Dave Evans did not get along with one of their fill-in singers, causing tensions among the group. Coupled with the fact that Evans’ singing was not always a good fit for their music, it eventually resulted in him being fired. Their music fully transitioned to a more raw sound then, drawing upon more blues tropes and relying less on the glam elements they experimented with earlier. They had eventually played enough local gigs to attract some pretty substantial attention – even opening for Lou Reed (funny coincidence, huh?). In search of a fresh face to lead the group, the band soon lucked out. 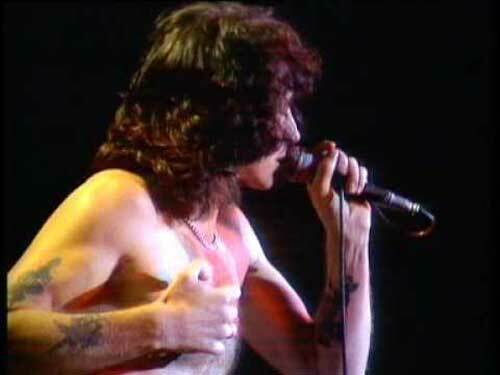 Ronald Belford Scott aka “Bon” Scott was the earliest singer for the band, but it didn’t start out that way. Interestingly, he actually was the band’s chauffeur first before he auditioned and was officially accepted into the band. Bon’s vocals were a great match for the intensity and power of AC/DC’s new sound, and his stage energy was captivating and raw. The band had only recorded one official single with their previous singer at this point, so they simply re-recorded with Bon and moved forward. By October 1974, the album High Voltage had been recorded and was released the following year. It took only ten days to complete, with most of the songs already finished by the time the band entered the studio. As mentioned before, Bon Scott was a new addition to AC/DC and this would mark his first official full-length album release with the band. Another member would join the band during that period as well: drummer Phil Rudd. A bandmate of his notified him of the auditions and he decided to try out. Of course, Rudd was hired immediately once the rest of the band heard his playing. They had found his nuanced-but-rock-solid style to be the backbone they were missing. At this point, their lesser-known bassist Mark Evans rounded out the remainder of the rhythm section and the early lineup of AC/DC was complete. In 1976, AC/DC hit a milestone when their manager, Michael Browning, sent some of their promotional material to London. It eventually made its way into the hands of Phil Carson at Atlantic Records, and a deal was brokered soon after. AC/DC had made its way to a major label and was now about to take off internationally. The first release, funny enough, was actually a compilation of tracks from their first two independent releases, High Voltage, and T.N.T. 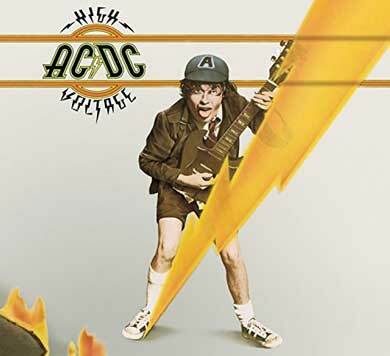 The release was then titled…High Voltage. A little confusing, indeed. The classic 1977 album was another turning point for the group, but not in a good way: the album almost never came to be at all. The band had been at a zenith in 1976 with the successful tour circuit in Europe but failed to remain relevant back in their home base of Australia. When they returned, the diminishing crowds didn’t bode well for the longevity of the group. Australians had partially felt betrayed that the group failed to return to play locally, and the crowds suffered because of it. To make matters worse, Atlantic was not happy with the Dirty Deeds album, feeling it wasn’t up to snuff in terms of its production, and that it didn’t appeal to American audiences. The label had considered dropping the band entirely, which could have spelled the end for AC/DC. 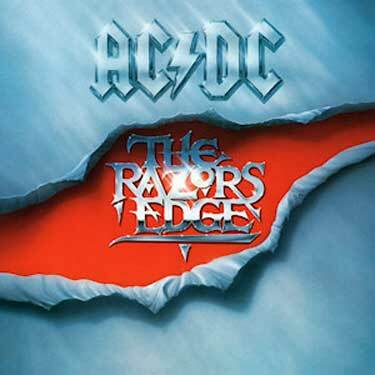 Before I can get to this album, I should note two releases that were crucial: 1978’s Powerage, which marked the addition of bassist Cliff Williams, and 1979’s Highway to Hell, which really needs no introduction. We didn’t feature any tracks from these two albums on our video, so a detailed rundown will sadly have to pass. Believe me — they are killer. Listen to them. The band were internationally renowned and fully established as a powerhouse rock band, but then tragedy struck: Bon Scott unexpectedly passed away while sleeping off an excessive night of drinking. The band was devastated and almost considered not continuing, but Scott’s family had implored them to go on, as Bon would have wanted it that way. They set out to find a new lead singer, and their producer Mutt Lange had suggested they bring in Brian Johnson. Angus had actually heard of him before from Bon who was impressed by his singing a few years prior. They figured it would be a great move to offer him an audition, and he impressed them all with his unique voice and presence. He was hired as the new frontman on April 1st 1980. The band had actually already started writing the material that would make it onto 1980’s Back in Black before Bon Scott’s untimely passing. This made it difficult for the band, but they felt invigorated by the addition of a new member. Coupling this with the production of Mutt Lange, the bigger bolder arena rock sound was really coming into its own on this album. In the early 80s, music was beginning to shift with a foreboding decline in the rock genre. Many say that this album helped to reignite the rock style and retain its success on the popular music format. Lucky for me this happened — I might be out of a job now, eh? Back in Black sold astronomically large numbers, making it one of the best-selling albums of all time. Numbers are in the 50 million range now, which is unbelievable. If you live on planet Earth, you’ve heard tracks on this album without question and know the “sound” of the album. Matter of fact, the album is so revered in terms of its production that it is considered the hard rock standard for the style. It is sometimes even used as a sound test for hi-fi systems still to this day. afforded them. Even still, they were plenty successful and several tracks from this era are still included in their live sets to this day. Once “Thunderstruck” dropped, they were back at the top again and began another world tour. Nothing sticks out more than the opening riff to “Thunderstruck” though. Nothing. 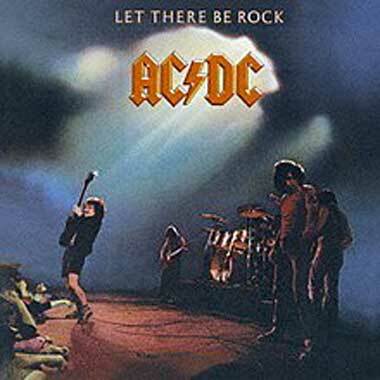 A guitar riff of legend, it’s another AC/DC riff that has likely graced the ears of every human being on this planet…and maybe every Guitar Center across the country, too. This brings us to our own loving homage of the riffs and solos of AC/DC. 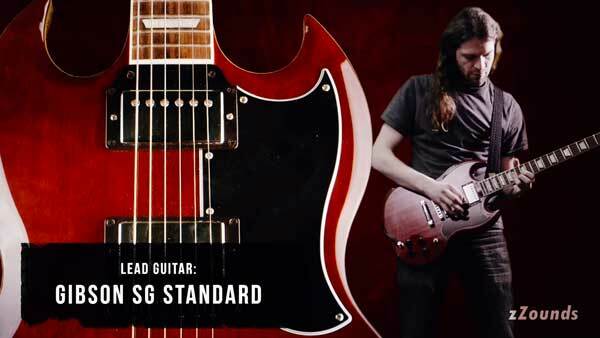 For this video we decided to go with one of our favorite formats: The Top Five solos video. Now this was no easy task — it took me a long time to feel anything close to satisfied with the choices of these songs, and I still wish I could’ve included about 10 or 15 other songs/solos. Alas…there are just way too many great solos in AC/DC’s catalogue, a lot of them lesser known cuts, so to make it onto my list, it needed to be an influential but relevant solo. For starters, Angus used a simple rig: a Gibson SG and a Marshall half stack. That’s it. He experimented with a few different guitars, Marshalls, and Wizzard amps too, but for the majority of his career, the SG/Marshall combo was the tried-and-true tone. That being said, I reached for a Gibson SG Standard and we tried out the newer Marshall Studio series amps to see how they held up. 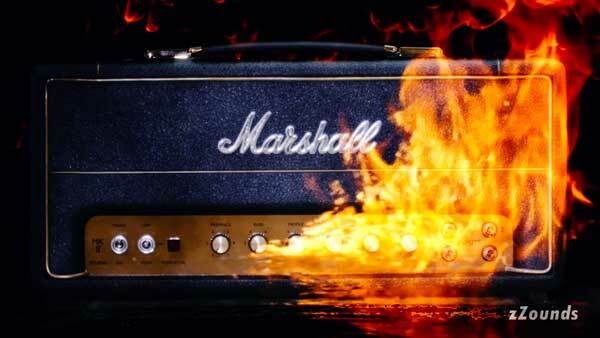 The whole series is a faithful but modern take on classic Marshall amps like the Plexi and JCM800. The timing couldn’t have been more expedient for us, as our Legends of Tone series is exactly that: nailing classic tones but with modern gear. 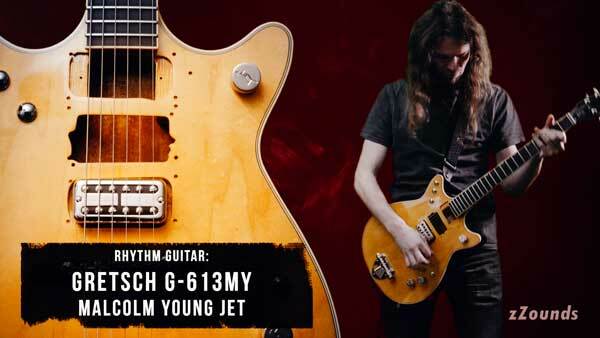 To round out our gear, we grabbed the incredible Gretsch G-613MY Malcolm Young Signature Jet guitar, which had a big bold hollow sound that really accentuated the big AC/DC chordal style. Long story short, the gear was perfect. In particular, the tone of the Marshall Studio Vintage Plexi was spot-on Malcolm. We tracked all of the rhythm tones with this amplifier, and had fun experimenting with super-low gain crunch tones all the way up to every-knob-dimed-out high gain sounds too. In a small case we used the Marshall Studio Classic JCM800 amp to recreate some of the Angus solo moments for extra oomph. This amp is more or less essentially the same circuit as Angus’ Marshall 2203 amp, but with higher gain available. The trick to the AC/DC sound is to keep the gain low/medium and see how it crunches at its loudest point. You don’t want too much saturation, especially if you are trying to replicate the earlier albums. Crunch, not distortion. For the solos you can juice the gain a bit to get the guitar to scream a bit, but again don’t overdo it. Less is always more! Overall, the amps both sounded phenomenal and were pretty forgiving with the tone settings, so it made it easy to just make quick adjustments and move on. No-nonsense stuff. 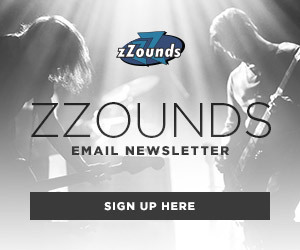 Turn ’em up and play some open chords and bask in its pure rock glory…Maybe crack a beer or two. Check out our video at the top of this post, and let me know what you thought of it in the comments. Cheers! Oy! Oy! Recovering music theory junkie. Local guitarist and guitar teacher currently on an endless quest of guitar mastery and self-discovery. Give me groove, or give me death.